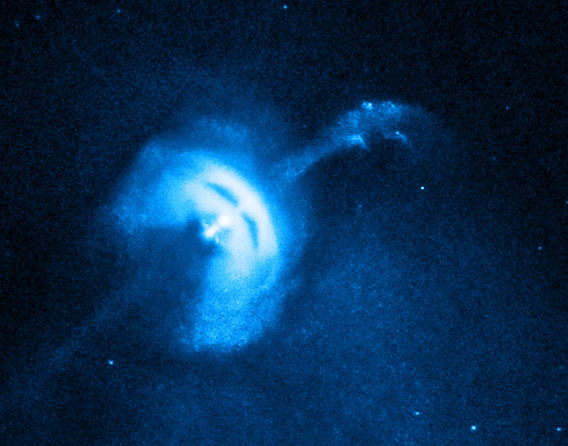 The Vela pulsar, seen in X-rays by the Chandra X-ray Obseravatory. Click to precessionate. At the center of the Vela supernova remnant is a madly spinning neutron star. It spins *11 times per second*, which helps it whip up a magnetic field so fierce it can actually defy the gravity of the star, which is a billion times stronger than Earth’s! All of this help it generate two beams of matter and energy that blast away from its poles. Recent observations of this beam show that it appears to be wobbly, making a corkscrew motion over a period of 120 days. This movie is made from 8 images of the pulsar and its weird beam taken by the Chandra X-ray Observatory.